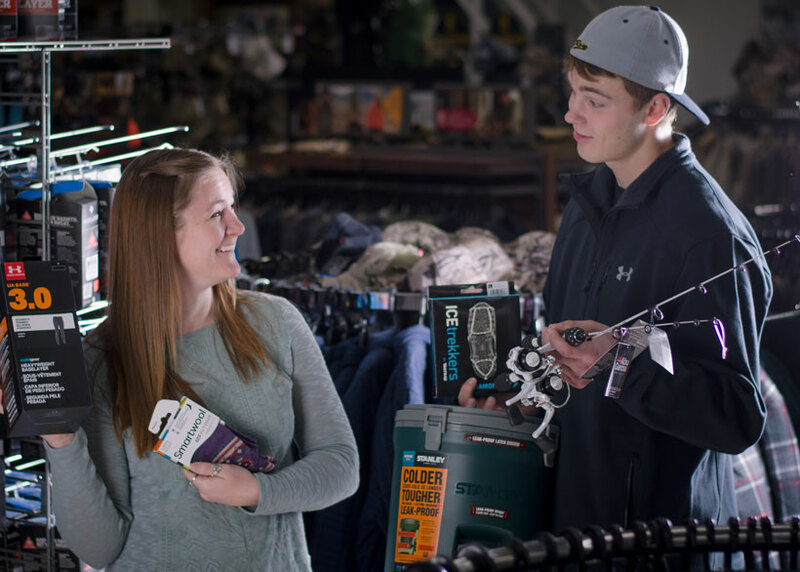 Hunting season is here, and Smith & Edwards has 4 new tools to help you have a big (& successful) adventure out there. Allen Co. makes a huge variety of shotgun & rifle cases that our customers love. New this year from Allen are these 2 all-in-one gun cases that will make hunting easier this year. 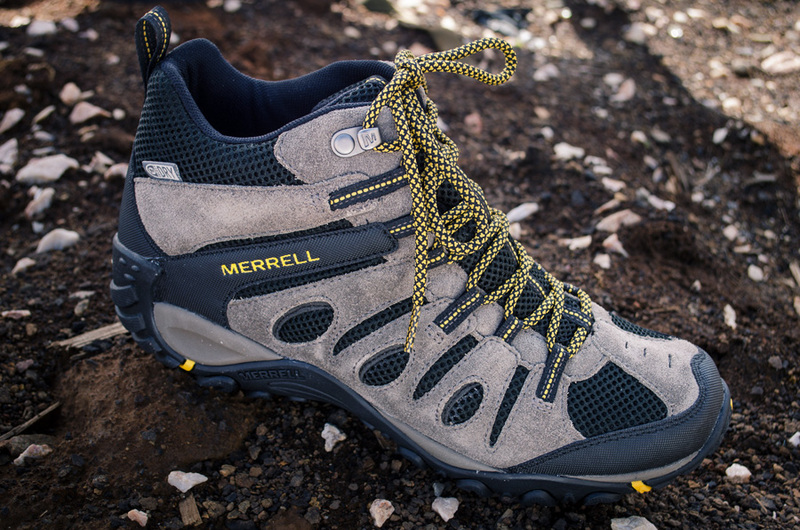 When you’re out in the brush or on the side of a mountain, you’ve got to have your gear close. Not only close, but all in the same spot, if possible. No extra rustling around to find your range finder or ammo if you can help it! 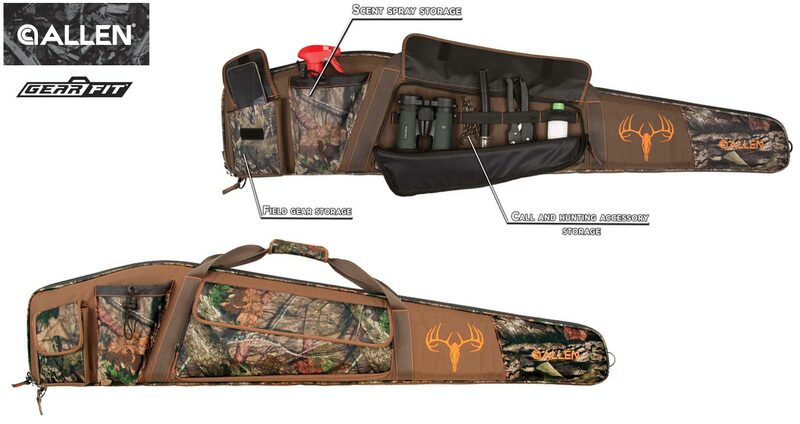 This MossyOak Break-Up Country camo Bruiser gun case has big pockets to keep your gear all in one spot. Keep your rangefinder, ammo box, magazines, scent eliminator, and other must-haves on-hand, so you only have 1 bag to keep track of when you’re waiting for that deer, cow, or bull elk. This 42″ gun case features two large pockets plus a cinching third pocket for a scent eliminator spray bottle, rangefinder, or water bottle. Click here to shop. The Waterfowl shotgun case will keep your duck calls, cleaning kit, choke systems, and shells all in the same spot, along with any shotgun up to 52″ long. You don’t need to drag a whole extra bag full of calls & cleaning supplies out to the duck blind or on your boat, along with your decoys, gun, and dog. Make it easy on yourself, pack all your gear into the pockets of this Realtree Max-5 camo duck hunting shotgun case. It features two gear storage flaps and 3 zippered pockets. Click here to shop. Maybe your binoculars are 15 years old and it’s time to step into newer glass. Maybe it’s time to pass your hunting binoculars down to your son (or hunting buddy) and upgrade to a new pair. Steiner’s the choice for you. Steiner uses high-end German glass in their optics to create excellent quality binoculars. These are true hunting binoculars, lightweight and easy to grip. And since the company is just getting started in the U.S., they’re not well-known, which means you can get them at a good price. 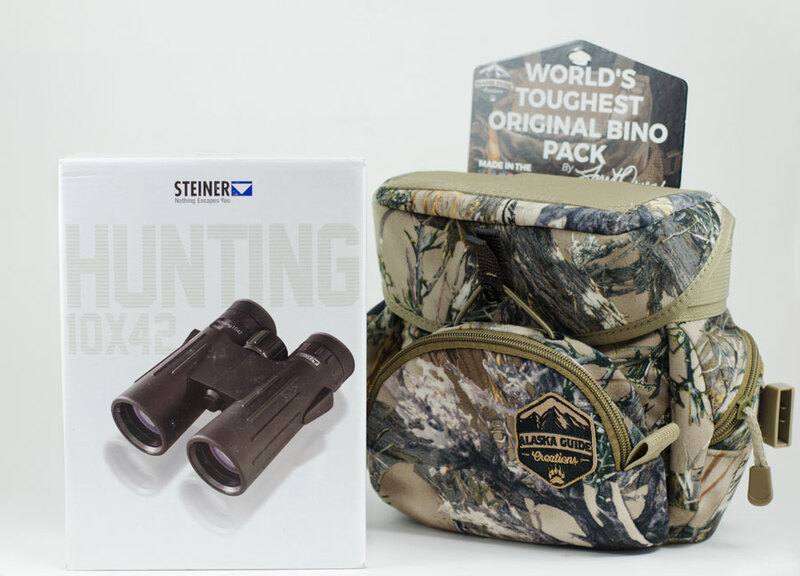 In fact, during our hunting sale on now through August 26, you can get these 10×42 Steiner binoculars for 249.99 at our Gun Counter – a $50 savings off the $299.99 regular price! With a brand-new pair of binoculars in your gear stash, there’s no way you’re going to use an old case for them, right? Ditch your magnetic-closure old binocular case and upgrade to this made-in-USA, ultra-quiet, rugged camo binocular case. It’s exactly what it says it is: designed by Alaskan guide Jaret Owens and born from the need to survive and succeed in any outdoor endeavor, this Kodiak Cub binocular case is designed to be quiet: no clicking magnets, no rough & noisy fabric. This high-quality binocular case features pockets, a cell phone slip on the top of the case, a back harness, and a 100% lifetime manufacturer guarantee. Click here to shop. 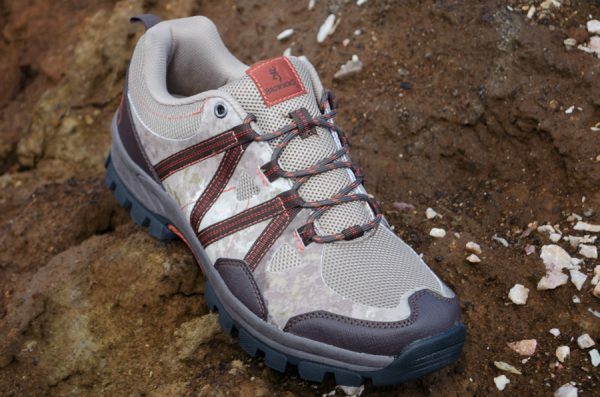 Now that you’re geared up, make sure you’ve got the camo you need, and get out there! 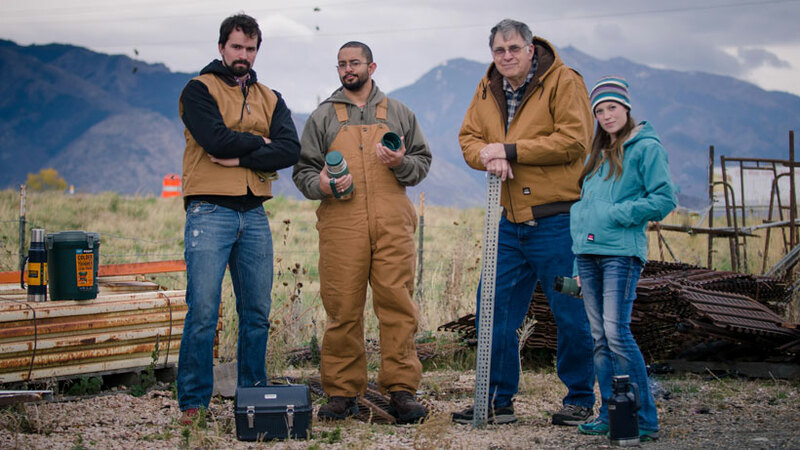 Have more questions about hunting in Utah? Check out the Utah DWR’s website or give us a call at 801-731-1120. We proudly sell fishing & hunting licenses at our gun counter. This spring, I went up to the Rainbow Gardens parking lot, and instead of taking Birdsong Trail like usual, my boyfriend and I hiked up to the Bonneville Shoreline trail! It was breathtaking getting to see behind the water pipe that goes over 12th street as it heads up to Ogden Canyon, and we got to meet some fun dogs and watch as people made their way further up the mountains above us. If you’re looking to hike or camp in the Uintas or Northern Utah this spring & summer, make sure & check out our HUGE selection of energy bars & meals, hiking packs, hydration packs, and more backpacking & camping gear. 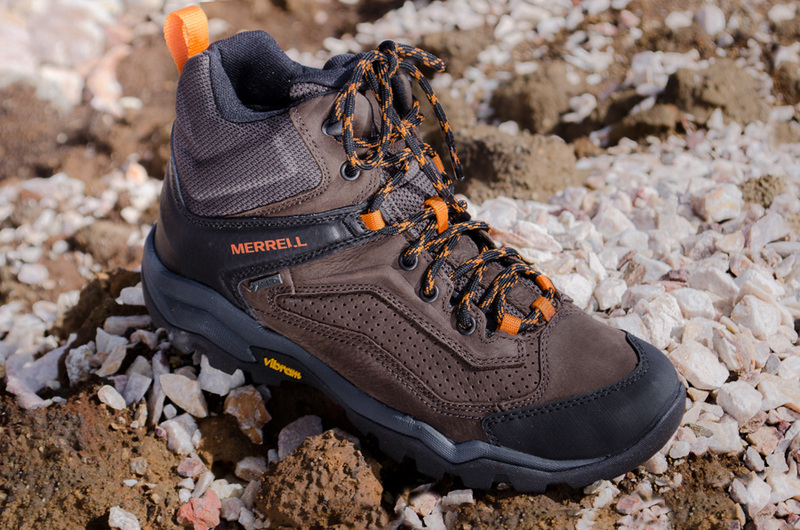 For me, I’ve never once regretted the money I spent on my pair of Merrell hiking shoes. 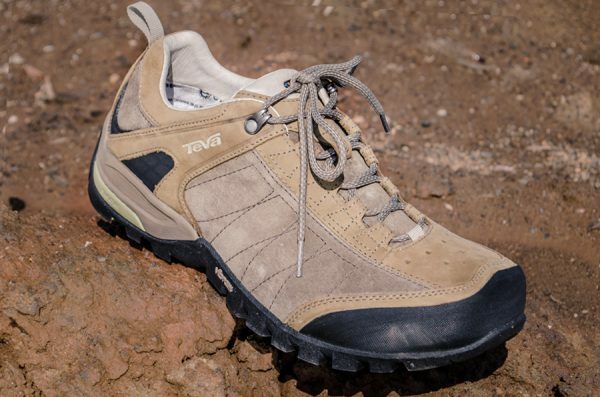 My women’s Moab mid hiking boots have helped me see Utah better than I ever imagined. I splurged for the Goretex water protection and it’s served me well. I’ve hiked through pouring rain, as well as photographed some amazing river scenes that would have otherwise left me with wet feet! 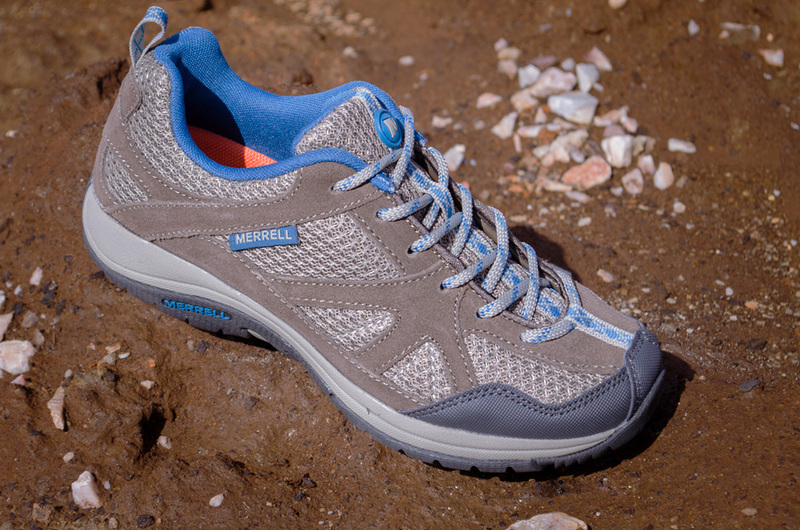 Speaking of water – we have many styles of water hikers in-stock for guys & gals. 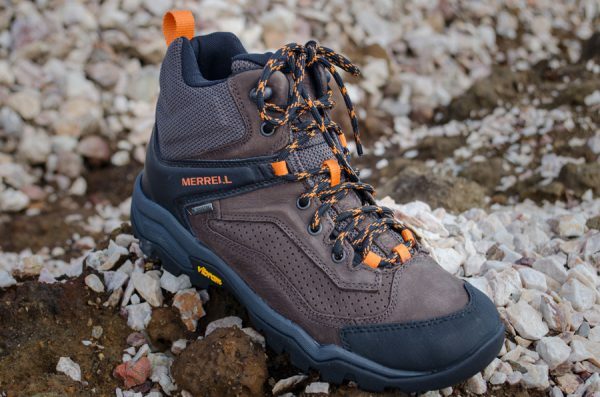 Steve Smith, our Shoes department manager, has brought in brand-new hiking boots from Merrell for men & women, as well as Under Armour, Teva, and our local favorite Browning. If you haven’t seen the valley from the Bonneville Shoreline yet, make this the year you make it up there! Whether your favorite views are from the North Ogden Divide, the 12th Street & Ogden Canyon area, or somewhere else like the Uintas (my goal!) along the Wasatch Front…. 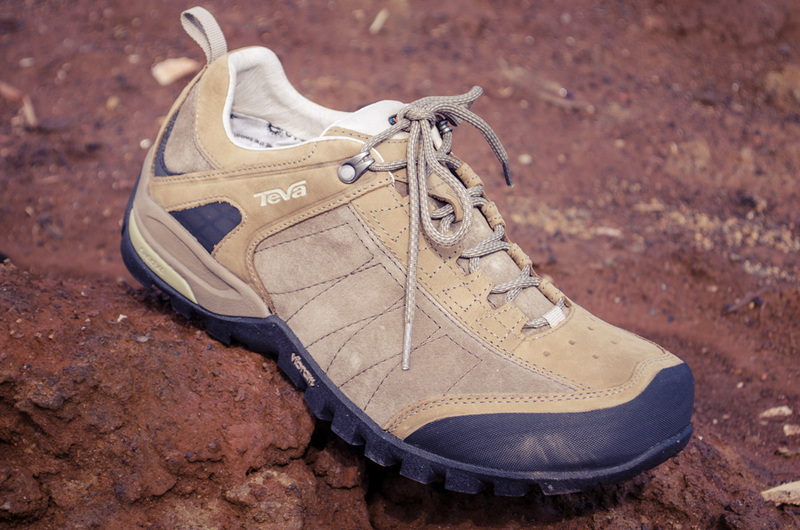 Let us outfit you with the shoes that will get you there. Now, all of these boots are going to have great gripping soles and some degree of water resistance. Come in to Smith & Edwards off I-15 at exit 351 and try them on for yourself. 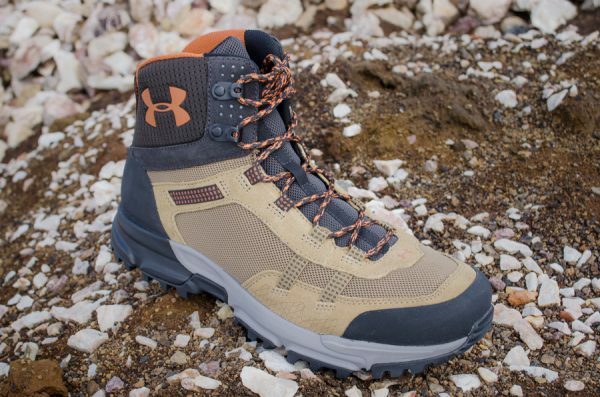 These are 6 men’s boots and 1 ladies’ pair in this feature, but there are MANY more styles from even more brands including Hi-Tec, Columbia, and more waiting for you here at Smith & Edwards! 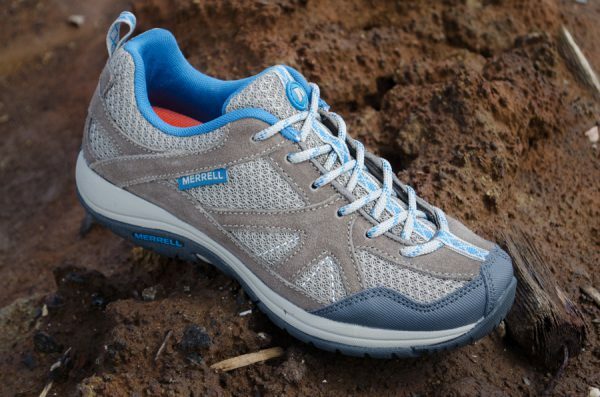 eVent waterproof membrane for keeping your feet dry while letting sweat escape – no clammy feet! 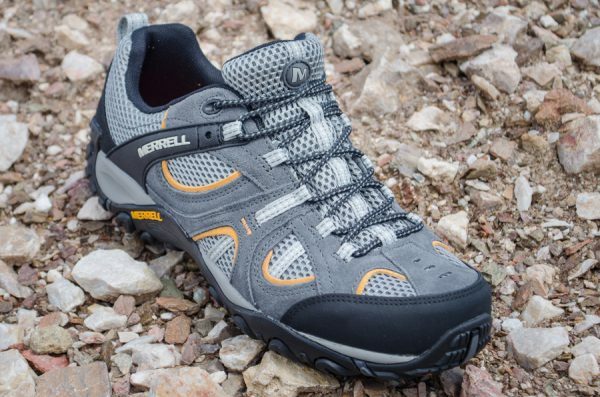 Comes with 2 pairs of laces, orange & brown! Special makeup – this color is a limited edition you’ll find only at Smith & Edwards and select other retailers! Come in to Smith & Edwards to Get your Gear! You’ll find everything you need here to have a great hike, whether it’s an after-work hike before sunset or a multiple-day trip in the mountains! 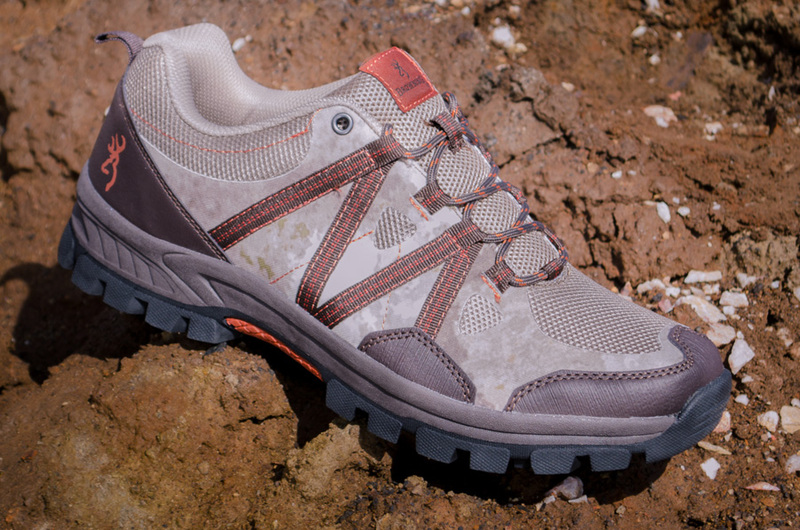 Come in and explore, and also click here to see our most popular boots & shoes, online. Water sports guru, Merrill Harris, does a lot of hard work for us here at Smith & Edwards. He’s also our paddleboard expert. Merrill will be one of the first tell you that stand-up paddleboarding is a BIG deal… and he’s right!! We love carrying Connelly and Jobe for all types of SUPs, knee boards, tubes, and skis. Whether you’re looking for the stability of a hard or soft-top paddleboard or the versatility of an inflatable one, we’ve got what you nee. View many of our favorite Connelly boards today! “But where can I store my fishing pole? ?” Don’t worry! Many of these great boards have bungee strap storage sections to secure your belongings. You can FISH from your paddleboard and so much more! 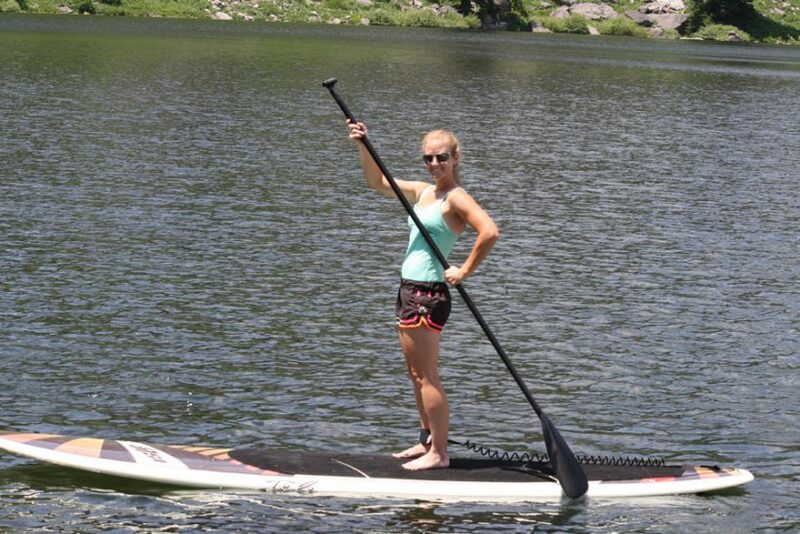 Where can I paddleboard in Northern Utah? 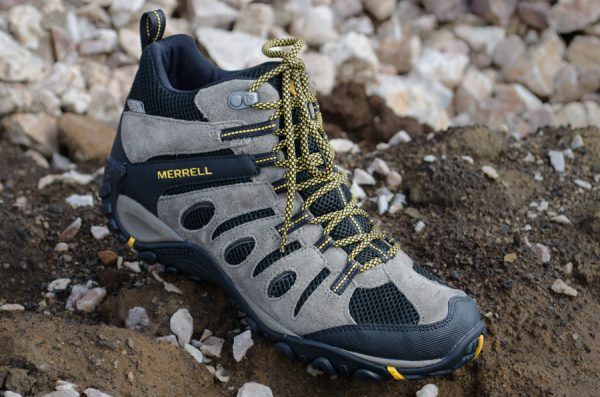 Merrill and his family have been to Willard Bay, Causey Reservoir, Tony’s Grove, and the Great Salt Lake. but anywhere you find a body of water will work great! 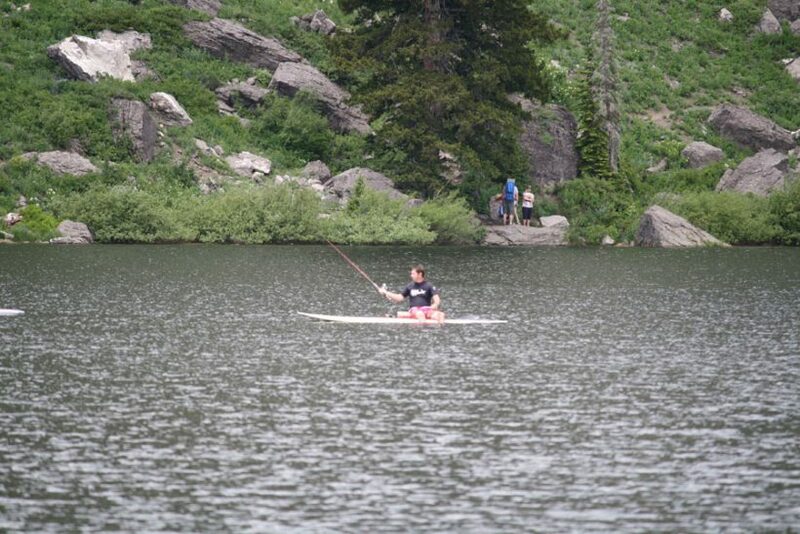 Take your board with you on your next trip to Bear Lake or Strawberry, Porcupine or Pineview Reservoirs. After seeing these pictures from Merrill’s family trips, our only question is…. When can WE come along? 2017 is our 70th Anniversary, and BOY have we been called a lot of names over the years! And not what you think: these are names we get called by people who LOVE us. Terms of endearment. Names like the BIG FUN STORE, Farr West Mall (or Plain City Mall), Smitties, Buck Brothers, The Cowboy Store… Even Smith & Edwards’ Surplus Plus! Click here for more about the history & team behind Smith & Edwards Co.
More than once we’ve even heard someone on a law enforcement scanner heading over for a fun stop at “Smutt & Ugly’s” (Don’t ask us how they came up with that one). What’s your family’s name for Smith & Edwards? Send us an email at help@smithandedwards.com and let us know! Here’s something people have learned the hard way: paint cans like to TIP OVER in the trunk. That’s bad news! StayHold trunk organizers use VELCRO to stick to the carpet on the bottom of your trunk & brace things in place – paint cans, bleach, groceries, plants, and more. Lightweight but tough, these plastic organizers can also hold your hunting, fishing, & emergency gear in place. These car & truck cargo organizers are selling very well, so check them out on aisle 44 by the Rope Room at Smith & Edwards! You can also click here to see them on our Web Store. 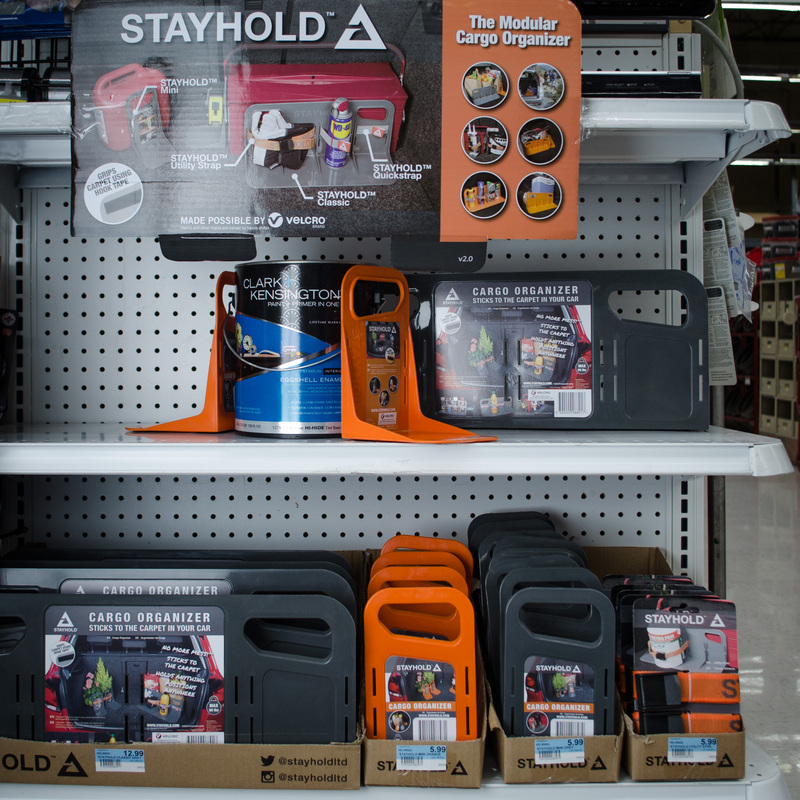 With winter just around the corner, we’ve stocked up on your must-haves for playing & working outside. 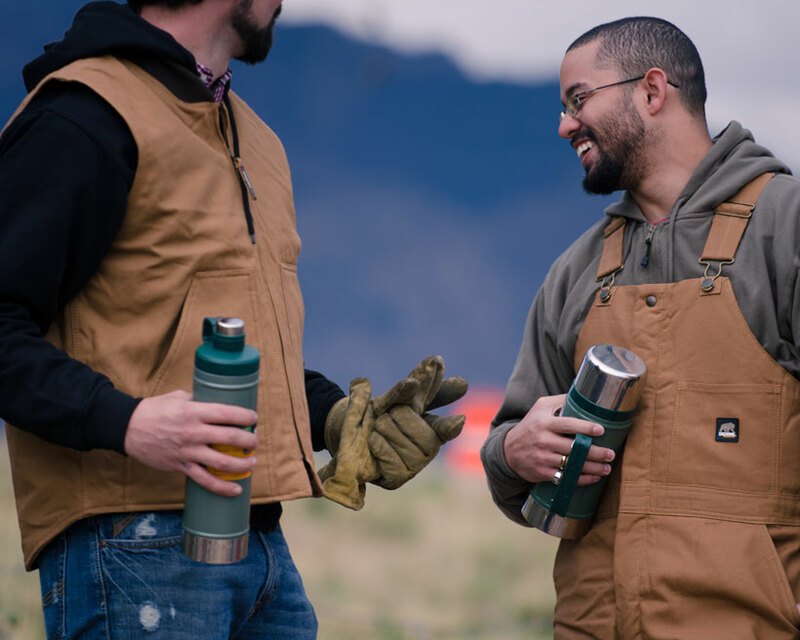 Whether your job’s out in the elements, or you like to play out in the snow, you’ll love these new clothes and food & drink items from rugged brands like Stanley & Berne. Some Smith & Edwards employees volunteered to help show off the new goods – thanks guys! 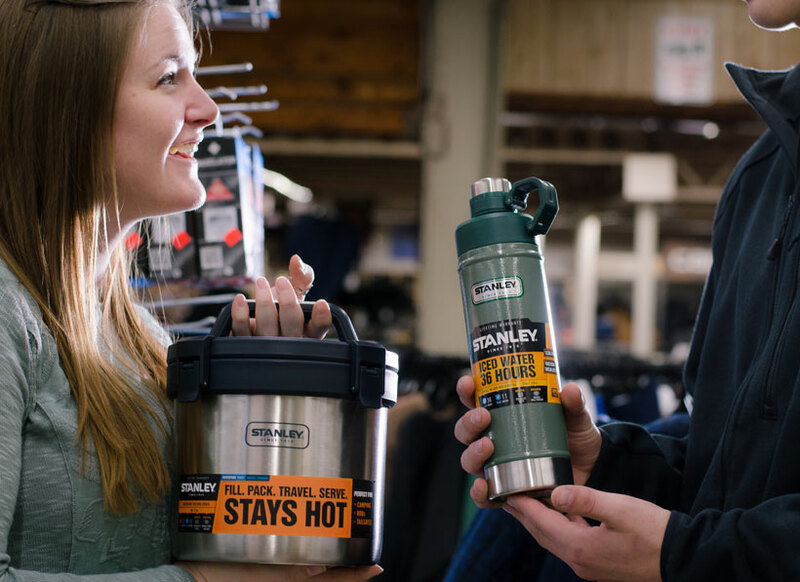 Stanley thermoses are the go-to for keeping coffee, hot chocolate, soup, & chili warm while you’re working at a cold job site. We visited the north yard at Smith & Edwards to put them to the test. These are tough enough to keep your meals & hot chocolate warm for 2 days. Now that’s good for just about any type of traveling or outdoor job. 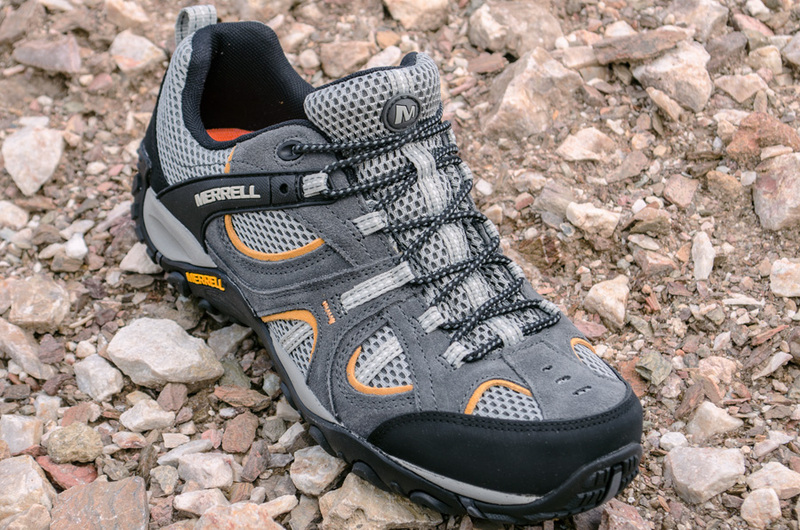 Not to mention they’re perfect for Ice Fishing & Elk Camp! 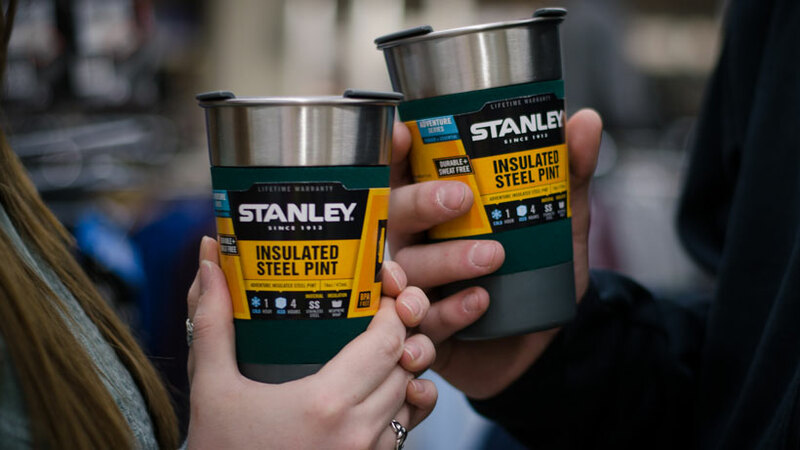 These Stanley insulated stainless steel pint cups have a grip built in. They come with a sipping lid, and keep your iced beverage cold for 4 hours! If you want to keep your cold beverages cold, Stanley thermoses are still the way to go! With growlers and cups, you’re covered for summer concerts & relaxing on the porch. New items from Stanley include a 2-gallon Adventure Jug Beverage Dispenser (bottom left), metal lunch box, insulated growlers, and new sizes of the time-tested Stanley thermos! We carry the old Stanley standards, plus we just got in brand-new styles! Stanley now has a crock pot and a water jug with spout dispenser in 1-gallon & 2-gallon sizes. There’s also a new Stanley lunch pail that nests a Stanley bottle or mug with plenty of room for food. EmmaLee’s Stanley 3-quart Adventure Vacuum Crock keeps hot food hot for 12 hours, and cold food cold up to 16 hours! Cole’s holding the Stanley 2-Stage Lid Thermos. Depending on which size thermos you buy, this insulated stainless steel thermos will keep ice water cold for 36-48 hours! Dreamed up in Utah, these genius reusable Dutch oven liners are here at Smith & Edwards! Sized exactly for your 12″ or 6-quart Dutch oven, there will be more sizes to come. Made to withstand temperatures up to 450 degrees, this saves you from hauling that heavy cast iron pan over to the sink or stream to scrape dried dessert off the sides. Just peel it from your Dutch oven, then hand wash or place in dishwasher! This blue Dutch oven liner will keep your cast iron clean! Plus: Click here for Dutch oven cookbooks. Click for our popular camo tablecloths! This new item is COMING SOON to Smith & Edwards…. watch this page for updates! Looking for more outdoor Cooking must-haves? You can see our clothing buyer, Craig, above. He just added a new line of workwear. Why? Berne’s jackets feature pleated action backs and elbows to let you move with ease when you’re working. 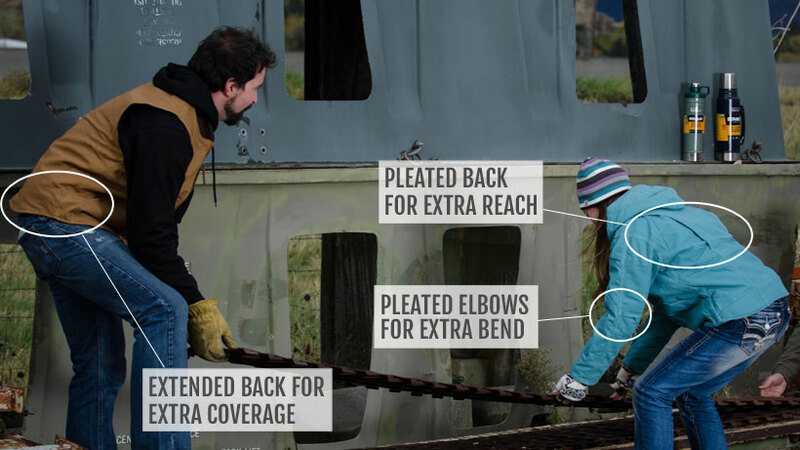 Instead of the whole jacket shifting when you reach or lift, the elbows and back extend to keep you covered. It’s a great product at a good price! Berne is also available for ladies! Styled & designed to fit ladies comfortably, you’ll find insulated work wear designed for women from the Berne product line. And it’s not just the tailoring: choose from traditional or fresh, bold colors like bright blue and dark pink! Berne is just the latest addition to our huge workwear collection. 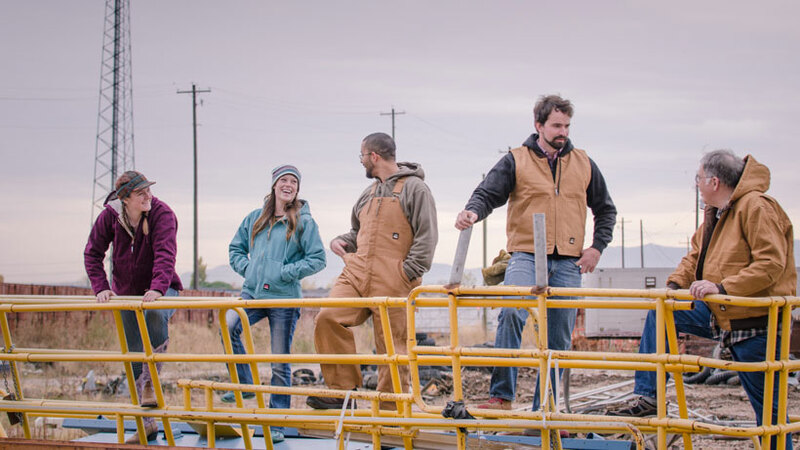 You’ll find Carhartt, CAT, Dickies, Ariat, and Wrangler RIGGS workwear in our store in Ogden, Utah as well as our web store. 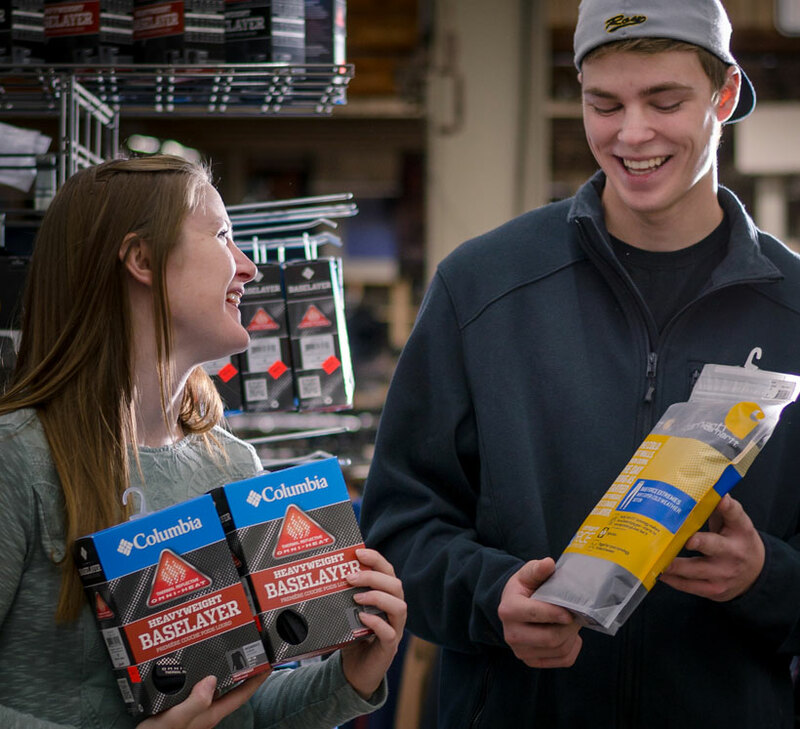 You’ll also find our customers’ favorite made-in-USA work gloves, Yellowstone Gloves (read why they’re a favorite, here). Bonus: Much of this gear is also great for Ice Fishing, too! Skiing, snowboarding, hunting, ice fishing – the key to staying warm in those awesome winter hobbies is to keep a synthetic base layer on! Cotton will actually chill you when you sweat – so choose a good top & bottom baselayer set from Columbia or Under Armour for ladies. 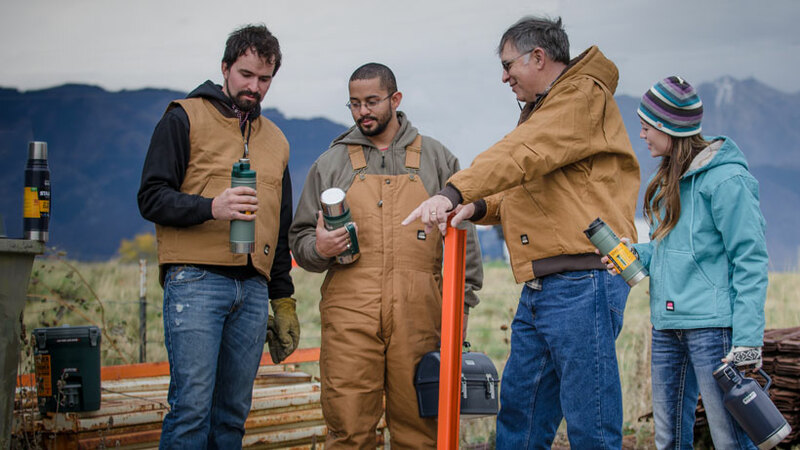 For the guys, we have those same brands plus Carhartt base layers available. We carry them for her! You’ll find women’s base layers for Columbia & Under Armour. They’ll keep her warm ice fishing! 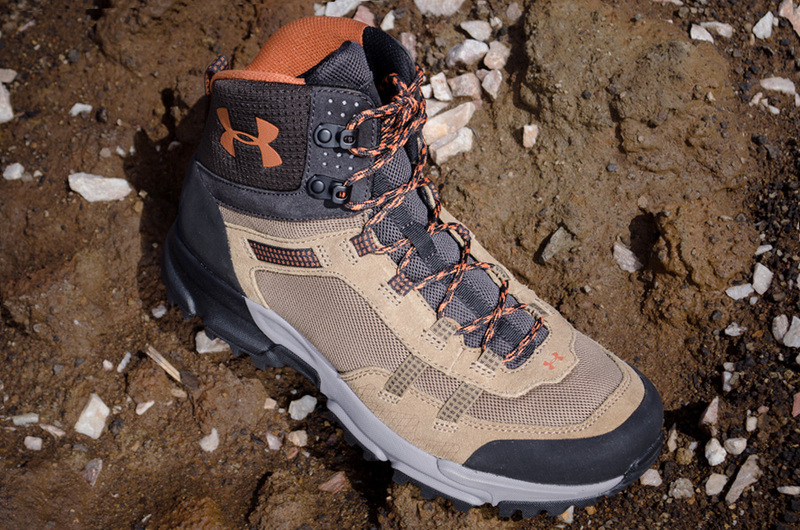 Get base layers for him: Carhartt, Columbia, & Under Armour to keep heat in & combat moisture! Thanks to Craig from Clothing, Nicolo from Receiving, Logan from Shoes, John from Lawn & Garden, Cole from Shipping, and Jerica & EmmaLee from the Web Store for modeling these products for us. You make us look good! We were privileged to have Travis Sparks come by and do a packing demo the other day. Hunting is a totally different experience with horses. One hunter told me his story about finally getting his deer right at the end of the day, and was dreading the hike back uphill to the truck. Luckily some horse packers saw him, came down, and helped him quarter & pack out the deer. He would have been out there way past sunset without their help! Packing isn’t just about packing out quarters. Your mule or horse might have tent poles, a shovel, lawn chairs, your bedroll, coolers, cooking supplies, or feed on his back. When you throw in antlers into the mix, packing turns into a real art & skill developed through practice. 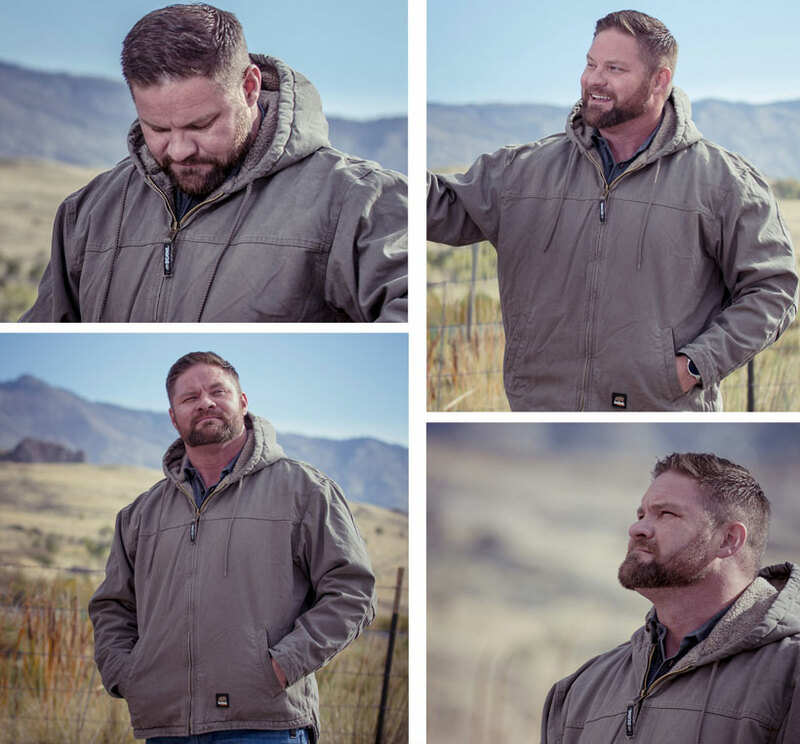 Travis is a member of the Back Country Horsemen of Utah & does a lot of packing himself. He gave us a detailed demonstration of the Double Diamond hitch, and answered several questions about packing. I split Travis’s presentation into two videos for you. First, you can see exactly how to do the Double Diamond knot on our trusted cavalry horse. This is a great hitch for top packing. Then, sit back and listen to Travis’s question & answer session about packing elk antlers, using a pack scale to balance your load, using soft packs vs hard packs, and tightening a cinch. Packing with a Double Diamond knot. Thanks to Troy Higgs for this picture! Use a 45-foot rope to make this hitch, which starts out similar to the box hitch. Make sure and pull the rope tight. 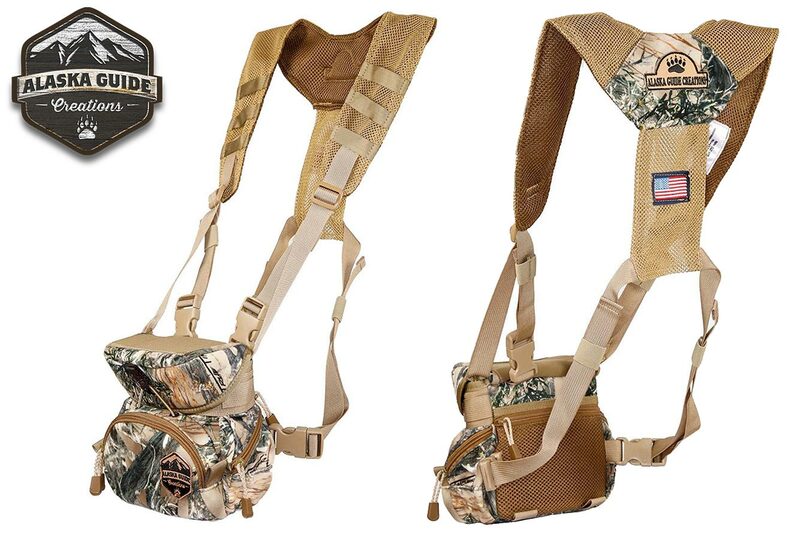 We make the pack bags shown in Travis’s demo, these are the #663 designed for coolers. 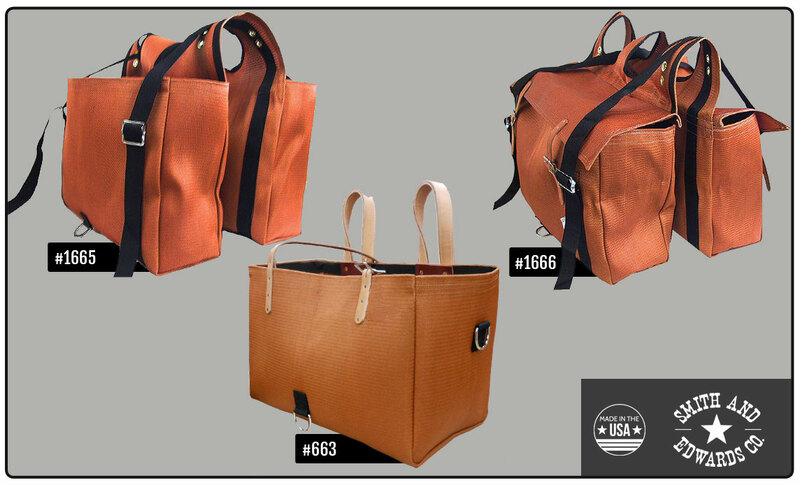 We also make a narrower bag without flaps, #1665, and #1666 with flaps. Of course I’ve got to mention that we proudly make those bearcloth packs you saw in the video, and you can get them right here on our online store. Click here to read about our Tack Workshop. Do you have questions about horse packing that Marty or Travis can answer for you? Let us know in the comments below! Check your cinch after moving your animal – always make sure it’s tight! 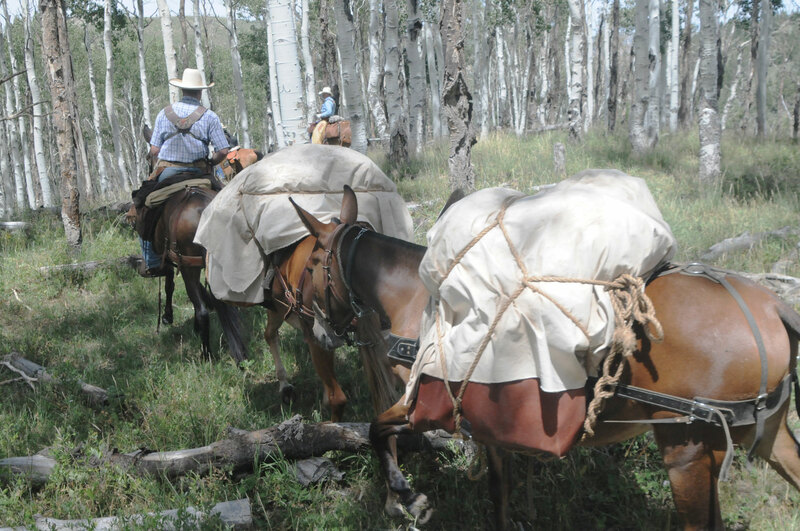 Keep your horse safe from antlers: make sure the rack moves along with the pack bags. Try not using a stick or a branch to elevate the horns, because they don’t ride well. Keep in mind what will hit a branch first: your pack bags or antlers? Don’t take shortcuts, don’t get in a hurry – pack it right. Rule of thumb, pack 15% of an animal’s weight. So for a 1000 pound animal, aim for 150-160 pounds split over the two sides. While I was walking past the Rope Room the other day, our Hardware buyer, Blaine Taylor, called me over. “I have a surprise for you,” he said. Next thing I knew, I found myself in a dark sideroom looking at a bundle of paracord that glowed in the dark! I like having reflective gear, especially as it starts to turn fall, so if I’m walking near twilight the cars can still see me. A glow in the dark paracord bracelet would be GREAT! 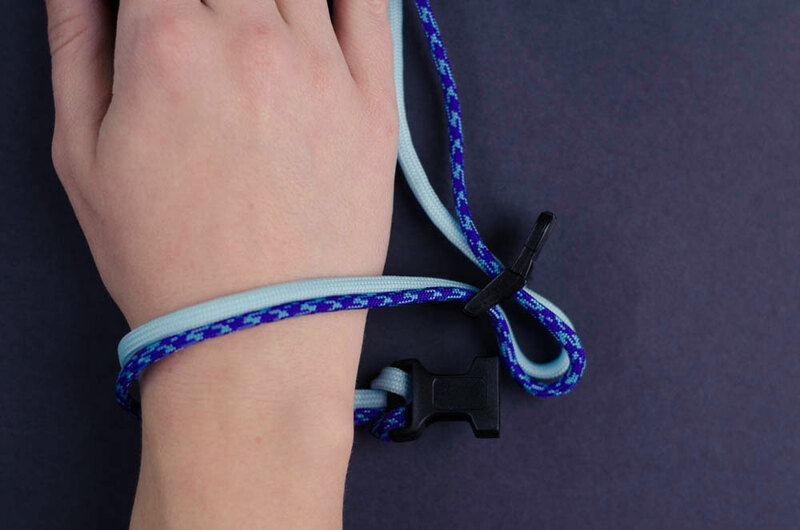 You can find reflective & glow-in-the-dark paracord online here, and at the Rope Room in-store at Smith & Edwards. This is some neat stuff! And the bracelet? Jerica in the Web Department helped me make it. Well, I found the bracelet and she figured how to make it! This is a Trilobite bracelet, aka ladder rack or boa paracord bracelet. Here’s how she made it! If you want a single color bracelet, use 170″ and skip step 1. 1. Thread the ends of your paracord into the receiving end of your buckle. Then, melt the ends together. Make a lark’s head knot, hiding the seam of the thread so it doesn’t scratch your wrist. 2. Put the paracord through the two openings in the other buckle. Measure the paracord around your wrist. Add 1/2″ and move the buckle to that point. 3. Tape the buckles to the table, with the 4 strand buckle at the top. You have 2 outer and 2 inner strands now. 4. 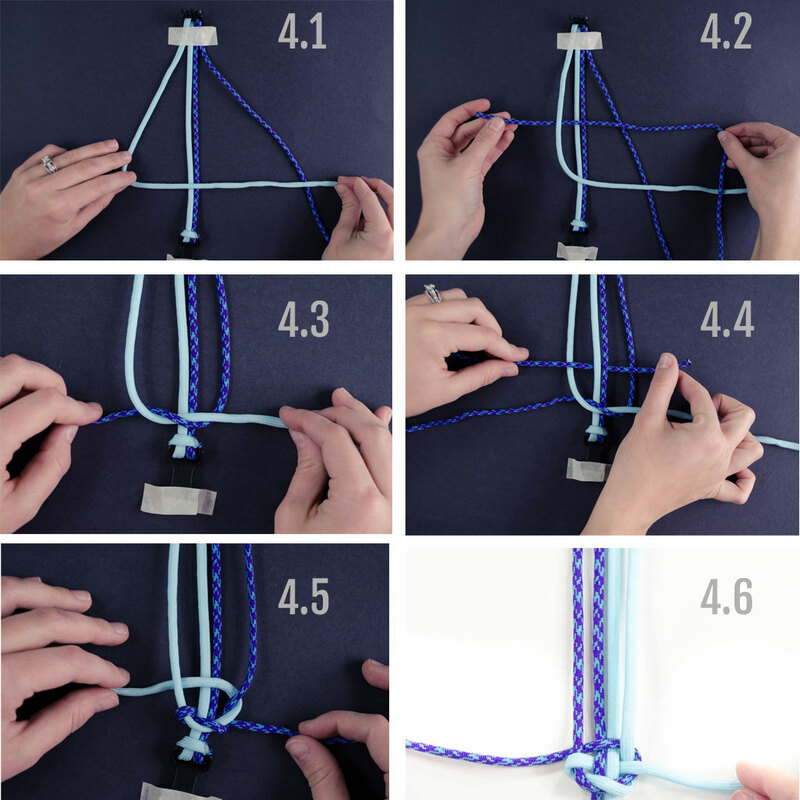 Make a 4 with the outer left strand, and hold it over all other strands. Bring the outer right strand over the 4 tail, over the inner strands, and under the 4. This will make a Granny knot over the bottom buckle. 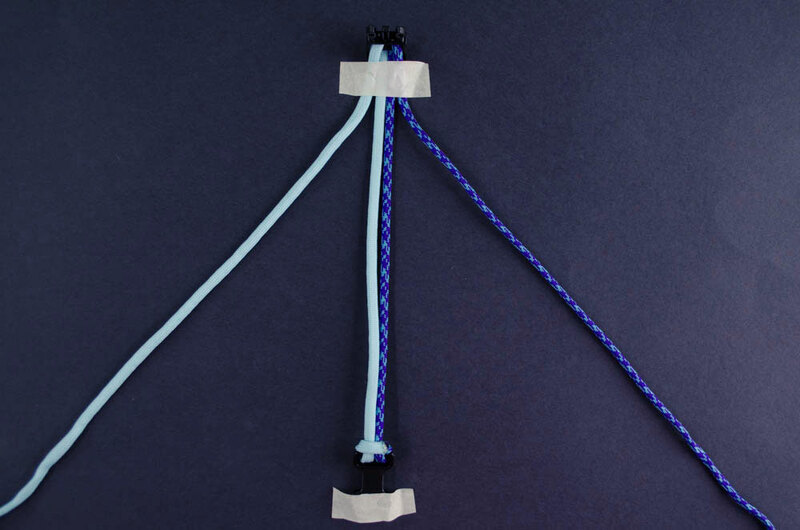 In the photo above, for the fourth picture, bring the strand you just wove with, over the outer left strand, under the inner strands, and over the outer right strand. Then, take the outer right strand and weave it under the strand you just wove with, over the inner strands, and under the outer left strand. Good job – you’ve finished the hardest part! We made the bracelet twice, and flipped the colors the 2nd time. We apologize! 5. Now we’ll just weave to the top of the inner cords. Take the left outer cord and weave it over the first inner cord, under the middle inner cords, and over the last inner cord. Take the right outer cord and weave it under the last inner cord, over the middle inner cords, and under the first inner cord. Repeat this process all the way up the bracelet! 6. Now and then, stop to adjust the snugness of the weave, so you can have a consistent & tight weave. Here’s how we finished the boa bracelet. 1. Push & tighten the weave. Then, loop the strands so that they are next to each other. 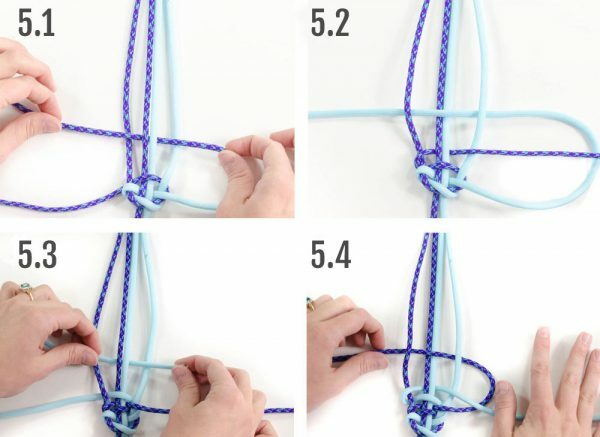 Trim the paracord to be just long enough to grasp. 2. Take your lighter and melt the ends of the strands. Hold the ends together and press with flat nose pliers to seal them together. 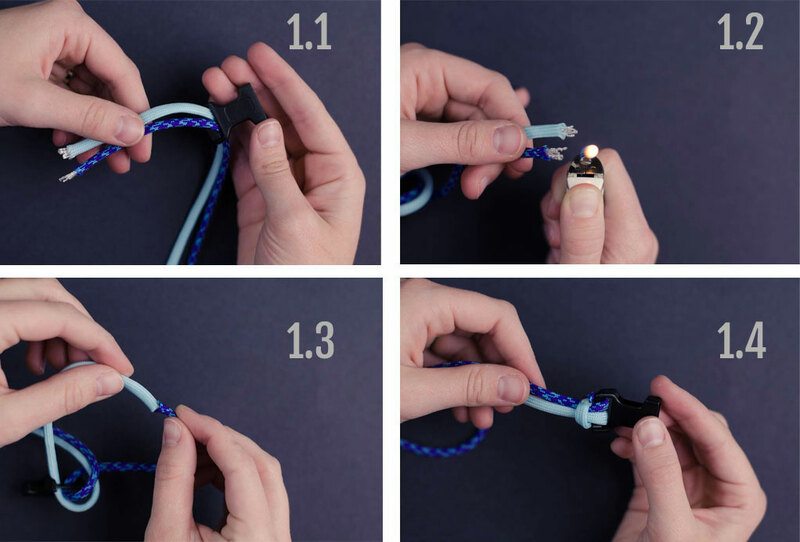 Tip: Have a friend hold the lighter for you, so you can hold one strand in each hand, and melt them together! You’re done! Enjoy your bracelet! 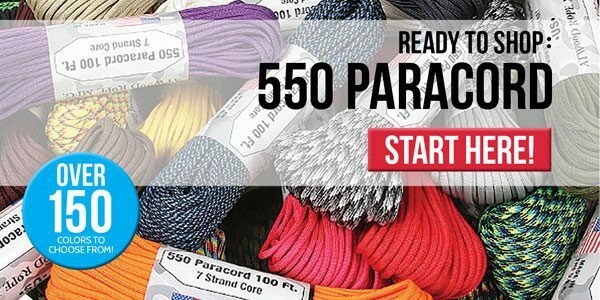 Want to make more Paracord Bracelets? Looking for more Paracord Bracelet patterns? Here are some sites & channels we found that have GREAT tutorials! This little battery can jump start your snowmobile, ATV, SUV, truck… even your FORKLIFT if you have one! REALLY! We’ve given several demonstrations of jump-starting trucks and cars with the Conversions Technology Power on Demand X-5 and its predecessor, the POD X-4. This jump starter comes in its own case that’s smaller than a laptop bag. It doubles as an LED flashlight and power supply, too: you can power your smart phone, laptop, iPod, and more off it. To charge it, I left mine plugged in overnight, which was more than enough time. You can also charge it in your car’s cigarette lighter. Click here to get YOUR POD x-5 from Power On Demand – and they’re on Aisle 8 in our Automotive department at Smith & Edwards. 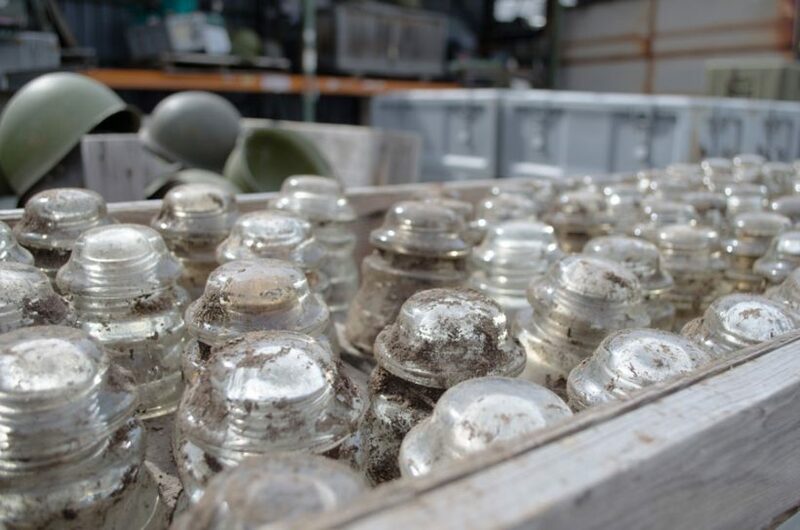 Bring New Life to these Antique Glass Insulators! While cleaning up the famous Smith & Edwards surplus yard this year (our first “spring cleaning” in several decades…!) – we found these AWESOME antique glass insulators. While you used to see these insulators on poles across the country, you’re much more likely to find them in museums or collector’s stashes nowadays. 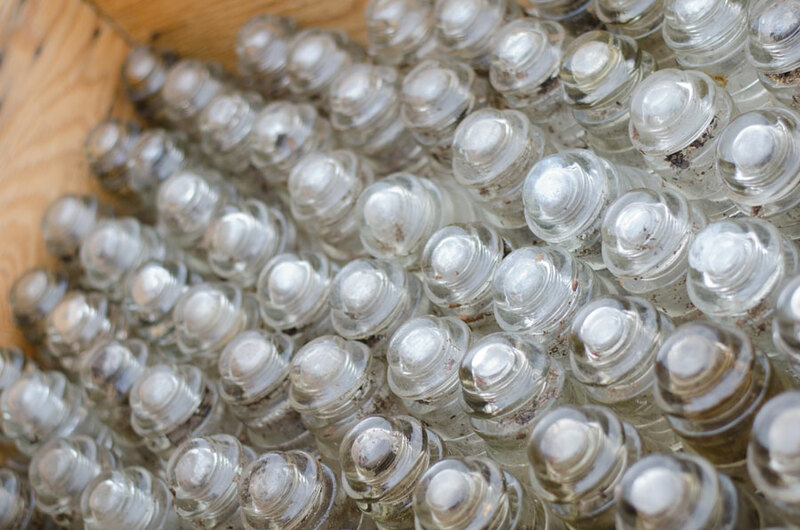 We have mostly the beautiful clear glass insulators in stock, as well as some beautiful tea-colored glass. 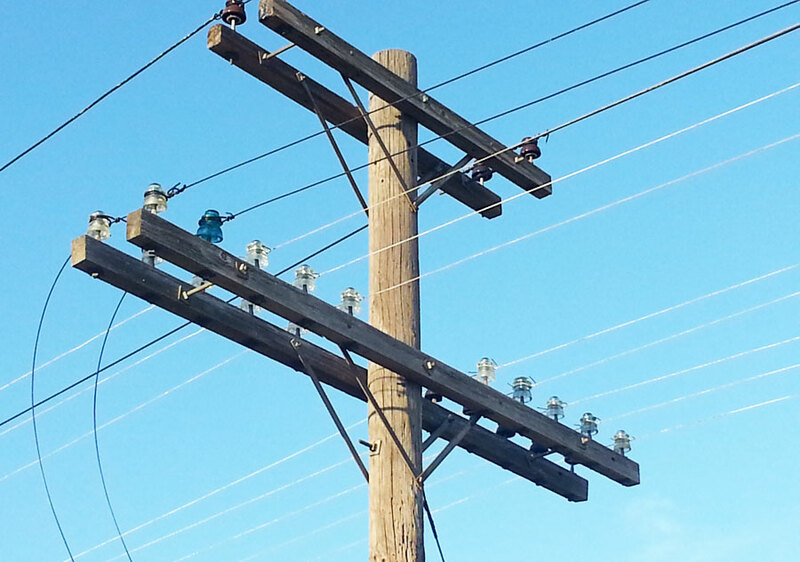 The striking blue color of insulators are rarer – I wish we had them, too! How did they come to be? They used to be found along power lines & telephone poles during World War II. These beautiful glass insulators screwed onto white oak pins to fasten the cables. This system didn’t use any metal that was so desperately needed for the war effort. Now you can make these fun insulators into bird feeders, candle holders, coat racks, & so much more. Come to Smith & Edwards on exit 351 off I-15 in Farr West, Utah, and see what other treasures you can find! You can also get these insulators shipped to you by exploring glass & ceramic insulators on our website.